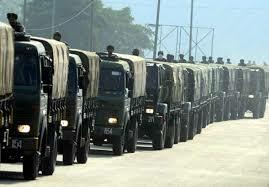 Home The NewsMill Troop movement: Outrage in Kashmir over highway closure. Troop movement: Outrage in Kashmir over highway closure. Two former Jammu and Kashmir Chief Ministers Mehbooba Mufti and Omar Abdullah have slammed the Centre’s decision to curb civilian traffic on the Jammu-Kashmir highway to secure convoy movement. The state government on Wednesday had announced that no civilian traffic will be allowed on the Jammu-Srinagar highway on Sundays and Wednesdays from 4 a.m. to 5 p.m. to ensure the safety of the security convoys.The restrictions will remain in force till May 31. Both former Chief Ministers were reacting to the order — a decision taken in the aftermath of the Pulwama attack on the same road that killed 40 Central Reserve Police Force troopers.”GoI’s current approach towards Kashmir has been consistent only when it comes to repression. Suffocate Kashmiris, throw them in jails, deprive them of basic rights and make them suffer. “They only want Kashmir. Don’t give two hoots about what happens to its people (sic),” Mufti tweeted.Abdullah, too in a series of tweets slammed the diktat: “Has anyone in the administration applied their minds before planning to issue this highway closure order? The decision was also criticised by senior separatist leader Mirwaiz Umer Farooq who called the decision “dictatorial”.Another former Chief Minister and Congress Rajya Sabha leader Ghulam Nabi Azad said the government “should work out a more people-friendly strategy than disallowing all civilian traffic for two days in a week”. The Kashmir Chamber of Commerce and Industry (KCCI) has warned the state government that the decision would have disastrous consequences. Previous articleTraffic ban tantamount to intrusion on civil liberties: Altaf Bukhari. Next articleNew Delhi only wants Kashmir, not its people: Mehbooba Mufti.